These masks are made on papier mache faces with light metal decoration. 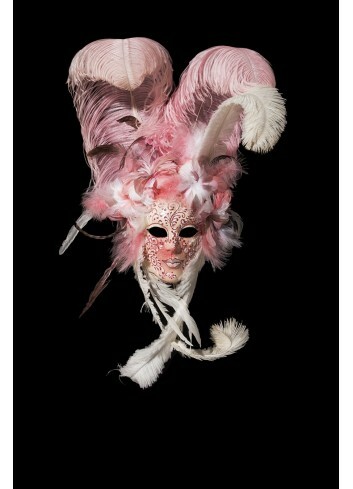 Each mask has ribbons to be worn at masquerade parties or special celebration. Siderea White and Gold Ready To Ship! 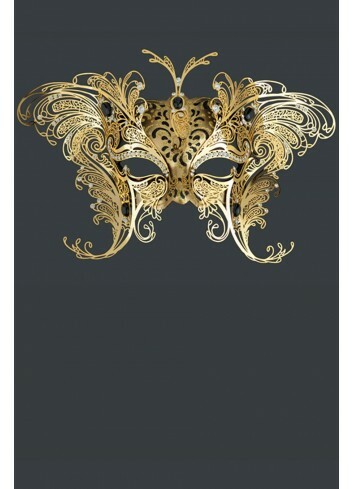 Siderea White and Gold authentic venetian mask in papier mache with leather decoration. Handcrafted according to the original Venice carnival tradition. Manufactured in Venice by the famous venetian masters. Each item is provided with certificate of authenticity. Blue Siderea Ready To Ship! Blue Siderea authentic venetian mask in papier mache with leather decoration. Handcrafted according to the original Venice carnival tradition. Manufactured in Venice by the famous venetian masters. Each item is provided with certificate of authenticity. Red Siderea Ready To Ship! Bronze Ignis Ready To Ship! Bronze Ignis authentic venetian mask in papier mache with leather decoration. Handcrafted according to the original Venice carnival tradition. Manufactured in Venice by the famous venetian masters. Each item is provided with certificate of authenticity. Gold Vega authentic venetian mask in papier mache. Handcrafted according to the original Venice carnival tradition. Manifactured in Venice by the famous venetian masters. Each item is provided with certificate of authenticity. Black Vega authentic venetian mask in papier mache. Handcrafted according to the original Venice carnival tradition. Manifactured in Venice by the famous venetian masters. Each item is provided with certificate of authenticity. White Vega authentic venetian mask in papier mache. Handcrafted according to the original Venice carnival tradition. Manifactured in Venice by the famous venetian masters. Each item is provided with certificate of authenticity. White Ignis Ready To Ship! White Ignis authentic venetian mask in papier mache with leather decoration. Handcrafted according to the original Venice carnival tradition. Manufactured in Venice by the famous venetian masters. Each item is provided with certificate of authenticity. Silver Siderea Ready To Ship! Pompeia authentic venetian mask in papier mache with metal decoration. Handcrafted according to the original Venice carnival tradition. Manufactured in Venice by the famous venetian masters. Each item is provided with certificate of authenticity. Domizia authentic venetian mask in papier mache with metal decoration. Handcrafted according to the original Venice carnival tradition. Manufactured in Venice by the famous venetian masters. Each item is provided with certificate of authenticity. Penelope Silver and Black Ready To Ship! Penelope Silver and Black authentic venetian mask in papier mache with metal decoration. Handcrafted according to the original Venice carnival tradition. Manufactured in Venice by the famous venetian masters. Each item is provided with certificate of authenticity. Leonardo venetian mask in papier mache with macramé lace decorations made in Italy. Handcrafted according to the original Venice carnival tradition. Manifactured in Venice by the famous venetian masters. Each item is provided with certificate of authenticity.